Joe Rosato is a tour guide at the New Jersey Vietnam Veteran’s Memorial Foundation. He has volunteered at the memorial since 2007. Joe enlisted in the U.S Navy from his hometown of Brooklyn, NY on Dec. 7, 1966. His basic training was at The U.S. Submarine Training Center in New London, CT. Joe Rosato served in Vietnam at Yankee Station in 1968 as a Helmsman and Lee Helmsman aboard the aircraft carrier USS America CVA-66. 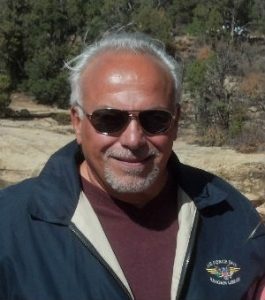 Joe Rosato is retired as an owner of a freight Logistics Company based in Wall, NJ and worked in the freight transportation industry for over 43 years. He lives in Farmingdale, NJ and has two children and two grand children. Joe is an active volunteer in The U.S. Coast Guard Auxiliary at the Manasquan Inlet, NJ. He also is a lifetime member of Vietnam Veterans of America, and holds memberships in The American Legion and Veterans of Foreign Wars. He considers volunteering at the NJVVMF a passion for giving back some history to the youth of New Jersey. I was inspired to write by the longing desire of telling my childhood story to my children and grand children. As I progressed writing my story it came very clear to me that it should be told to all and just maybe it will inspire other unfortunate child to never give up when their skies are darkened. There is always a better tomorrow in everyone’s life. I’m a seat of the pants writer who could hardly type but the strong feeling within gave me the ability to continue. I’ve learned a great deal since writing my memoire and I’m planning on my second book which will be fiction based on a true event. Put your mind to it and lay out your story in your mind or on an written outline and don’t be afraid to continue even if you come to a blank space. You can always return when your completed thoughts are guiding the way. I was asked with a three minute notice to be a keynote speaker at an event with over 500 people in attendance. I was dumb founded at first be decided to tell some of my stories and the younger audience sucked up my years of experience and gave me three standing ovations along the way. When finished I was told that former speakers who were Politicians and Admirals could not hold the audience’s attention like I did. I think that book publishing will move exclusively into eBook form and paper copies will be obsolete.